It seems unlikely that Pakistan’s military establishment will take much comfort from the postponement of Moscow format of Afghan peace talks scheduled on 4 September, but this is the best the Russians could do under the circumstances. The Americans’ refusal to participate in the talks was too obvious to ignore: the United States is one of the most important and influential players in the Afghan conflict, alongside the Taliban and Pakistan. Russia had recently announced that it had invited representatives from many countries, including the US, to attend the Moscow-format consultations on Afghanistan. 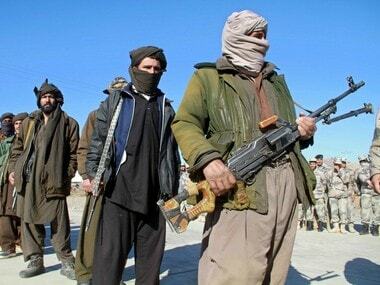 The Taliban were also expected to participate in the consultations as the primary aim of the talks, according to the Russian foreign ministry, was to “end the fratricidal war and to establish a peaceful and independent Afghan state free of terrorism and drug threat”. The Taliban’s participation was supposed to mark its first attendance at such an event; it had rejected a similar Russian offer to attend a multilateral conference in Moscow last year. Though Afghanistan has emerged as a chessboard for the mutual rivalries of major powers — a sort of new ‘Great Game’ — it would not be entirely correct to interpret an increase of Russian interest in the region from the perspective of its geopolitical rivalry with the US. Moscow’s increasingly active role in the efforts to end the Afghan war can also be attributed to the genuine anxieties about the emergence of the Islamic State in Afghanistan and Washington’s failure to end the conflict. But the Moscow event was viewed by the Donald Trump administration a direct blow at its own efforts to engage the Taliban in direct talks. Expressing scepticism about such a move by Moscow, the US had decided not to participate. If Russia is increasingly seen coming under the strategic shadow of Pakistan, Moscow is equally aware of the strategic possibilities of exchanging information and intelligence with the Taliban, whose bitter enmity with the Islamic State is a well-known fact. Russia has repeatedly voiced its concerns about the possible chaos that threatens to destabilise the borders of Central Asian countries and also spill across the southern borders of Russia. On the other hand, Washington and Kabul often accuse Moscow of providing moral and material support to the Taliban as a counterweight to the IS as this perception has been gaining ground that Moscow’s involvement in the reconciliatory efforts would only serve to further cement the Kremlin’s ties with the Taliban rather than convincing them to resolve the Afghan conflict. Therefore, Russia’s decision to postpone the Afghan talks must be seen as a positive development since it indicates Moscow’s eagerness to take Kabul on board for tangible progress. Nobody disputes the fact that the Moscow talks present a number of opportunities in dealing with the resurgent Taliban. But the question is: why shouldn’t the efforts be made at ensuring that the Taliban are defeated militarily? The most important reason for engaging with the Taliban is the undeniable realisation that they can no longer be defeated on the battlefield. The Taliban resurgence is a foregone conclusion whether the international community likes it or not. In recent years the Taliban have made impressive gains in rural areas and have briefly seized several cities. It is another matter that American air and other military support have ensured they are not able to capture big urban centres. Therefore the question is how to make their comeback more acceptable by bringing them to the negotiating table. No matter the venue, no matter the topic—the Afghan peace talks return again and again to the same old song – Pakistan. That association makes the Taliban especially problematic. India has had a bitter relationship with the Taliban due to several reasons. However, the most important is the umbilical cord that links the Taliban with Pakistan’s Inter-Services Intelligence (ISI), and use of Afghan territory to train anti-India terrorists. One could convincingly argue that the alliance between ISI and the Taliban, regardless of with what motivations it was established, has played the most decisive role in transforming the Taliban of the 1990s, which was ill-organised and amateurish, into a professional and hierarchical body with state-like features. Pakistan’s military-intelligence apparatus has played a crucial role in the professionalisation of the Taliban’s military and intelligence apparatus, in designing its battlefield tactics and counter-intelligence mechanism. What is required at present is a new relationship between Afghanistan and Pakistan. They are capable of dealing with the Taliban jointly, both politically and militarily. Afghanistan needs to pacify the areas under the Taliban control, and Pakistan must help by making its territory inhospitable to them. Both can also work on joint management of disputed border and resolution of the refugee problem. The US engagement is essential to their success, as would be Russia’s and China’s involvement. But Pakistan is not thinking in these terms. Instead, it has defined the Afghan conflict very narrowly. The manner in which Pakistan’s military establishment has been trying to achieve its highly objectionable aims with the help of Russia and China has only served to prolong the Afghan conflict. Despite the repeated demonstrations of the Taliban’s impressive military capability to capture more and more Afghan districts, the main stakeholders would need to know whether they are willing to change their violent ways. In order to assess this and to nudge them to terminate their bloody fight for the Afghan territory, it is important to engage them. However, there is no indication that the Taliban have changed their attitude. Russia is reportedly not very happy at the Taliban’s intransigent rejection of Afghan president Ashraf Ghani’s latest offer of a second truce following a successful three-day ceasefire in June. Although the Taliban did offer to release several hundred prisoners, there was no direct positive response to Ghani’s proposal of a three-month truce. Moreover, the centre of Kabul was hit by rockets as Ghani made a speech on peace. After considering all other options, the discussion always reverts to finding an acceptable political solution. But the irony is such a solution is as elusive as the military one. Even if the Taliban express the willingness to engage, they still need to travel a long way to adapt to the prevailing political setting in Afghanistan. In other words, they are yet to learn the ropes of statecraft. They are not amenable yet to the idea of an Afghan political space where there is no monopoly of power by any one group or ideology. Although, the ideological basis of political legitimacy claimed by the Taliban primarily involves religion, given the cultural and ethnic diversity of Afghanistan, and politics deeply rooted in tribal loyalty, it is impracticable for any single political outfit to govern the country with an iron hand. The Taliban are intransigent on a number of basic issues that frequently come up as serious difficulties on the negotiating table. They continue to remain non-committal on the question of democratic rights, partly due to their lopsided interpretation of Islamic beliefs, and partly due to their fear of losing an open election without the help of the gun. For the Russians, and the Kabul government, it would not be easy to accept the Taliban if they do not agree to assume power through a democratic process. It is likely that when the Taliban talk about a power-sharing deal, what they have in mind is to grab a slice of power on a platter. In the backdrop of increased diplomatic outreach by the Taliban and a series of peace overtures from the Afghan government, New Delhi has realised that the Taliban could anytime return to power in Kabul in one form or another. Given the Taliban’s past behaviour towards India, New Delhi’s largely cautious approach towards the peace talks is understandable. However, there is an urgent need for New Delhi to play a more proactive role vis-à-vis the Afghan peace process. India’s participation in the Moscow format is a reflection of this changing approach. In the context of the emerging political realities in Afghanistan, India needs to make use of its good relations with Russia to engage all important stakeholders.